A few months ago, I watched the 0:5 defeat of Rayo Vallecano against Barcelona. Impressed by their (tactical) bravery, the high pressing and the nearly absurdly intense approach, I composed a little hymn of praise – which was harshly criticized. How could a team be any good if it lost that crushingly? In the following weeks and months, Rayo displayed good performances, has the second most goal attempts in the Primera Division, ranks a third place in terms of possession, only outdone by Barca and Bielsa’s Bilbao and temporarily reached a great third place, despite having one of, if not the smallest budget in the league. After they lost relatively high against Barca again, at first I renounced a classic analysis. Instead, I chose something new; a pictorial team analysis rather than the familiar form of a match analysis. I hope it knows how to please. Well, Barcelona pressed (as usual) relatively interesting. From time to time they stood in a 4-1-4-1-shape which switched into a 4-1-3-2, but more often formed a 4-4-1-1/4-4-2 or even a 4-3-3. The usual strong pressing which had become quite unusual in the last few weeks. 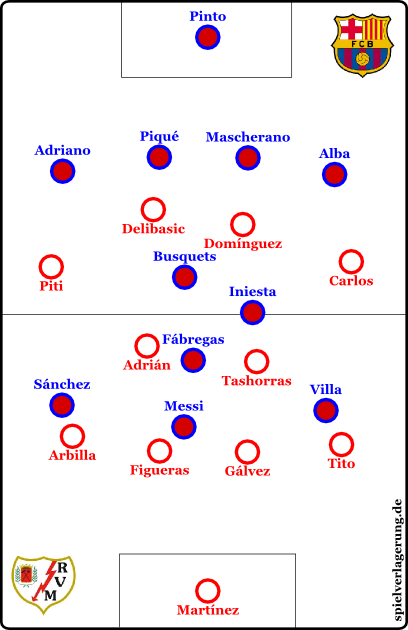 To avoid the pressing of the Catalans, Rayo turned to nearly absurd formations in their build up play. All midfielders played very flexible, the center backs sometimes dropped extremely deep and took a very wide position. Also quite interesting were the passing patterns of the Vallecas. Repeatedly they stood very narrow in the middle, which seemed weak but was highly interesting. They played cutting passes in these areas, let them rebound and played back. Question was: Why is that? The answer is here: Of course Barcelona tried to win the ball and the forwards pressed backwards and the defense line moved forwards. But due to the playing of Rayo they were pushed back. Barcelona lost 20 meter in 6 seconds. But not only the Catalans pressed high. Rayo too did not leave any space to Barcelona. They shaped into a 4-4-1-1/4-4-2 where the deeper player orientated himself towards Busquets. The metronome of Barcelona was taken into their covering shadow or – as shown here – the responsibility to cover him passed to the defensive midfielder who moved forward. Quite possibly they were even more aggressive in their pressing than the host and top favorite. With their style of playing, openings emerged, especially between the lines next to the forward moving defensive midfielders. They made up for this with horizontal compactness. On the other hand, this movement harmed the staggered arrangement in the width of the pitch. In this case, Adriano got the ball. Due to the fact that the remaining defensive midfielder oriented himself towards the Barcelona player between the lines and they pressed the ball-carrying player on the wings in a bending movement, they created a pressing trap. Eventually the ball was passed from Fabregas to Alexis on the wings who lost the ball. This is no critic because he was systematically isolated. This situative man-marking was frequently used by Rayo. This is especially obvious in this picture. The right wingback of the Madrilenians moved particularly far forward. And again, it is one of the defensive midfielders who marks Busquets. The same goes for this situation. It is too bad that individual pressing movements cannot be displayed in frozen images. But one can imagine the motion of the forwards from this image. After all there was not only situative man-marking. Occasionally Rayo changed the marking style, in particular after passes in certain spaces (primarily in the center where they were outnumbered). They switched to a zone-oriented zonal marking (there are more variations of zonal marking, which I discussed here) which increased the pressure in the center but opened the wings. In this situation Messi is pressed by three players. He simply passes the ball backwards and Barca dangerously changes the attacking side. Another characteristic in the pressing of Rayo was the way they build up pressure when Barca was circulating the ball from crowded areas backwards into their area. Most opponents remain in their position or follow cautiously. But not Rayo. They let the highest player chase the ball in a way Olic does while the rest moved up. Because he pressed the right centre-back first, the centre-back naturally passed to the left. Rayo’s forward orientated himself towards the second center back and took the first in his covering shadow. The situation continues with a pass to the goal keeper. The up-moving pressing forced Barca to pass to their goalkeeper instead of building up a new attack. To make sure this works as planned, the half-left (left defensive) midfielder sprints towards Pique. Nevertheless Pique received the ball but was not able to turn around and had to play back to the goalkeeper. Busquets wanted to help Pinto but was also covered. A long, wide ball of the goal keeper followed which led to conceding of possession. Rayo also showed counter pressing. In this exemplary scene they show why this can work very effectively against the Catalans. In this picture you can see Rayo’s loss of possession. … and one wins the ball back. Barcelona scored 88 goals already this season. Three of them after counter attacks. All three were scored in this game. Rayo simply did not act sufficiently intelligent enough to prevent these attacks, neither the safeguarding of their attacks nor in the defensive duels (although you have to admit that the 3-0 from Messi was hardly possible to stop without additional support). The first goal was preceded by a bad pass which was caused by the lack of coordination of two teammates. The 2-0 was caused by a single player who stood to deep. This opened the opportunity for a pass behind the defensive line. Messi used this chance cold as ice. Barcelona had the superior individuals, was better when in possession and in the creation of chances. Rayo too frequently chose to stick to long-range shots or made the wrong decisions in their offensive movement. A lot of attacks on the wings also caused problems after a loss of possession. Eventually the Catalans deserved the victory, but mainly thanks to the brilliant interaction of Messi and Villa their individual brilliance and some individual mistakes by the Vallecas. The underdog won the pressing battle but lost the battle over the result. Nevertheless they reached a convincing 47% of ball possession, 17 shots (8 on the goal, Barcelona managed to get 10) and forced the Catalans into a, for their standards, weak pass success percentage of 83%. Thanks to laola1.tv for the pictures! And I’d also like to thank our translator, Stefan Meißner. Many thanks – as usual!